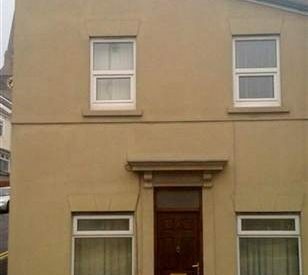 An unassuming semi-detached house in Wales has become an unlikely Web star after Internet users decided that it looks a lot like Adolf Hitler’s face. The Swansea home’s tan-colored, four-window facade stared out from British tabloid newspapers Wednesday following heavy distribution on social networking sites. Its resemblance to the dictator’s face is debatable. The lintel above its door vaguely echoes the Nazi dictator’s toothbrush mustache, with the black sloping roof reminiscent of Hitler’s side-parted hair.